I did a series of posts last week on my favorite moments at CCDA. As I was going back over my notes I thought I would write a post on one other thought that stuck with me from the conference. The Friday morning session of CCDA was a panel on education reform, and it began with a video from Michelle Rhee’s interviewat the Global Leadership Summit. 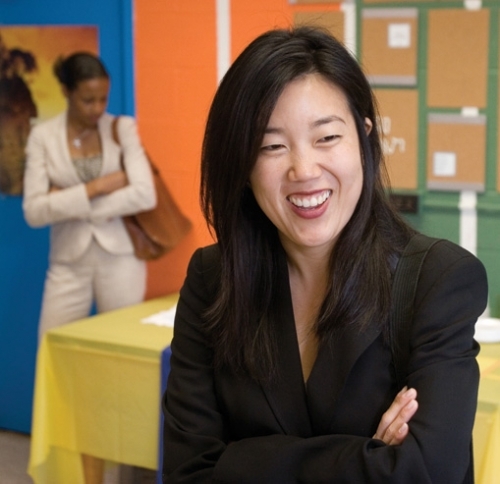 Michelle Rhee is an animated, engaging, and at times controversial national figure on education. I didn’t see the interview during the Summit, but enjoyed the clip I saw at CCDA. She said something in her interview that has stuck with me ever since. She was talking about her time working in the public school system in Washington DC, and the struggle they faced around how to best evaluate students and teachers. They were struggling to find an equitable balance. On one hand, they understood that they couldn’t evaluate teachers on the same set of universal criteria – each teacher was in a unique context, and each student was coming in to that teacher’s classroom with a different set of challenges. On the other hand, they knew it was important to evaluate teachers somehow. Otherwise there was no way to be certain that a student was growing under the tutelage of that teacher. So they began to use the phrase “Value Added.” This was the language they used to describe the value a teacher added to the educational experience of the child. They would measure where the student was at in their educational development at the beginning of the school year, and then again at the end. They believed that this allowed for the individuality of each student while also holding teachers accountable to help that student progress over the course of that year. The reason that stuck with me had little to do with education ultimately. That makes sense to me, but I don’t feel I’m in a position to comment intelligently on the veracity of that particular method. Instead, what stood out to me was how important that same idea is for Christian teachers, leaders, and preachers. What if we used the idea of “Value Added” as a way to measure the effectiveness of our call to disciple and nurture people? What if we looked at where someone was at when they first started coming to our church, and then again a year later? There is certainly something to be said for the importance of each person taking responsibility for their own spiritual growth. If a person is unwilling to learn and lacks the desire to grow, then there is not much that we can do as Christian leaders. But the reverse is true too. If a person does want to grow, and they spend a season under our spiritual leadership, then that is an incredibly important stewardship issue. Are we preaching and teaching in a way that helps people know God better? Are we cultivating an atmosphere that both brings people to the heart of God and then sends people out into the world on mission? Are we both modeling and training people how to live in authentic, Biblical community with their brothers and sisters of faith? That evaluation method has really been sticking with me. How much “Value Added” am I bringing to the spiritual formation of those who are with me at River City? How different are they now than they were a year ago? this is an interesting one, so often Pastors ‘measure their success’ in terms of the size of the bank account or the number of people in attendance on Sunday. Also, often, Pastor’s breed a ‘dependancy’ with the people they are entrusted with … perhaps ‘value add’ should be measured in terms of freedom & independance gained? Maturity. Ability to stand on my own two feet, think for myself, question & seek answers to my questioning, my ability to disagree, to formulate my own opinion … maybe the succesful Pastor is the one who breeds people who ‘walk away’ into the sunset on their own quest?